Yesterday’s TKPOTD looked back that first of many posts titled Qapla’. That first post dealt with The Dread Deadbeat Pro-Se Kimberlin’s futile attempt to get a peace order against me. A year ago today, we had a twofer: Qapla’ and Qapla’—Again!. Congratulations to Patrick Frey and his lawyers, Ron Coleman and Bruce Godfrey: The Fourth Circuit Court of Appeals has affirmed the judgment of the District Court in the Kimberlin v. Frey RICO Remnant LOLsuit Appeal. Brett Kimberlin has maintained his perfect record of losing all cases he has brought before the Fourth Circuit. 28 August, 2016: manafortwatch dot org website becomes active. 23 September, 2016: Last post made to manafortwatch dot org. 28 September, 2016: Last Russian hacking story prior to the 2016 election posted at protectourelections dot org. 31 October, 2016: Kimberlin v. Breitbart Holdings, et al. filed, a sealed LOLsuit seeking damages under 42 U.S.C. 1983, a civil rights statute. Other defendants included Stephen Bannon, the estate of Jerry Barnes, and Kenneth Trigoning. Barnes had been the State’s Attorney for Carroll County Maryland. Trigonning is a retired Carroll County Sheriff. 8 November, 2016: Hillary Clinton loses the election. 17 November, 2016: $100,000 “reward” offered by the protectourelections dot org website for evidence of election fraud. Not everything proceeded as he had foreseen. T. S. Eliot starts off The Wasteland with these words: “April is the cruelest month …” In The Dread Deadbeat Pro-Se Kimberlin’s wasteland the cruelest month is probably March. On 13 March, 2015, his bogus peace order petition against me in the District Court of Maryland for Montgomery County was denied Judge Williams. On 13 March, 2018, his Kimberlin v. Breitbart Holdings, et al. LOLsuit in the U.S. District Court for the District of Maryland was dismissed sua sponte by Judge Hazel. On 14 March, 2018, the Kimberlin v. Frey RICO Remnant LOLsuit appeal was dismissed by the Fourth Circuit Court of Appeals. Per curiam. The dismissal wasn’t even worth an opinion. On 17 March, 2015, the Kimberlin v. National Bloggers Club, et al. RICO Madness LOLsuit in the U.S. District Court for the District of Maryland was dismissed by Judge Hazel. On 30 March, 2016, the Kimberlin v. Hunton & Williams LLP, et al. RICO 2: Electric Boogaloo LOLsuit in the U.S. District Court for the District of Maryland was dismissed by Judge Hazel. Dull roots with [late winter] rain. But that may be related to everything proceeding as I have foreseen. Now that yet another move has been completed, Breitbart Unmasked Bunny Billy Boy Brett Unread has resumed posting wasting bandwidth, and “Staff Writer” has begun using the nom de cyber of “Langston Hews.” (I’ll bet that Hews’ hues are not the same as Hughes’.) BU still seems to be avoiding any further coverage of the pervalanche, especially as it as affected underage girls. And that reminds me of the TKPOD from four years ago today. 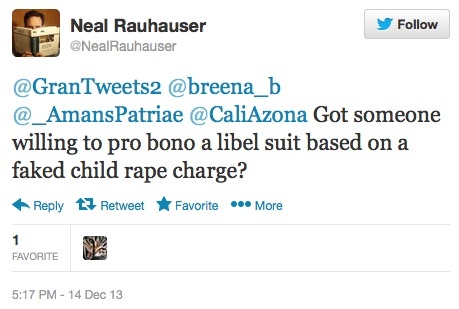 It seems that Neal Rauhauser has been trolling for a pro bono lawyer for a friend. IANAL, but the ones I’ve talked to say that anyone with a righteous libel claim against a defendant with deep pockets should have no trouble finding a lawyer willing to represent him on a fee-contingent basis. Pro bono representation is generally provided to defendants rather than plaintiffs. Of course, those observations come from many of the same lawyers who told me that the reason they suspect that The Dread Pro-Se Kimberlin is pro se is that he can’t find a lawyer willing to risk his law license by signing court papers making the unfounded allegations Kimberlin is bringing. Of course, The Dread Deadbeat Pro-Se Kimberlin failed to offer a “scintilla” of evidence that he had been defamed in his Kimberlin v. Walker, et al. LOLsuit, and all the other suits he’s brought against me have been dismissed for failure to state a claim upon which relief can be granted. All of his other LOLsuits he’s filed during the past four years have been dismissed as well—with the exception of the Brietbart Holdings, et al. case which, as can be seen in yesterday’s TKPOTD, appears to be headed for it’s own speeding end. The Team Kimberlin lawfare is slowly grinding to a halt. Yesterday, I posted the news of The Dread Deadbeat Pro-Se Kimberlin’s voluntary dismissal of his appeal of the RICO 2 Retread LOLsuit. While pro se litigation can be done on the cheap in a trial court. Appeals are expensive, especially in state courts that require submission of 15 bound copies of each brief and 10 bound copies of record extracts. That can add up to thousands of pages. Perhaps TDPK is finally getting the message that his return on his costly investment in his lawfare has been negative. The TKPOTD from four years ago today dealt with the question of how long it would take Kimberlin for figure out how badly he was screwing up. In January 1987, in federal court in Madison, Wisconsin, Kimberlin sued Crest Paragon Productions, alleging false advertising, breach of contract, mail fraud, conspiracy, and violations of the Racketeer Influenced and Corrupt Organizations Act (RICO). 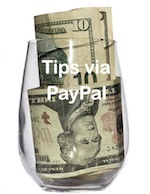 … He asked for compensatory and punitive damages totaling $150,000. After “a [redacted] Reagan appointee” dismissed the suit on procedural grounds, Brett appealed to the Seventh Circuit but was told he’d have to pay an additional filing fee. “I decided at that point I’d spent enough on this,” he said. One wonders when he will come to the same realization in his current Rico Madness. Kimberlin still has two cases that aren’t dead, Yet. One his appeal of the Kimberlin v. Frey RICO Remnant LOLsuit in the Fourth Circuit Court of Appeals. It’s the remains of the RICO Madness case. The other is Kimberlin v. Breitbart Holdings, et al. which he filed in federal court at the end of October, 2016. Judge Hazel has issued a show cause order to Kimberlin requiring him to explain why the Breitbart case should not be dismissed because the complaint Kimberlin filed violates a protective order issued in the Frey suit. OK. Time to order more popcorn.